Padula's origins date back to the IX-X centuries, when, after the Saracen invasions, the population - which had previously taken refuge in the hills - once more settled in the foothills near to the consular road, where the town is located to this day. 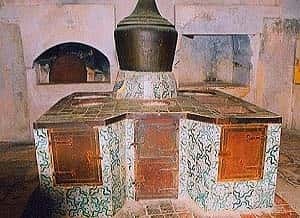 The Basilian Monks helped found the site of the Charterhouse, as we know from the Church of San Nicola alle Donne and the remains of the ancient Monastry of San Nicola al Torone. In 1296 Tommaso II Sanseverino, Count of Marsico and Lord of Vallo di Diano, took possession of the city; in particular, he was attracted by the site of the Abbot of Montevergine's Grange of St Lawrence. In 1305 he made a deal with Abbot William to obtain all the goods of the Grange and donated them to the Carthusians of St Bruno. The act, stipulated on January 28 1306, gave rise to the first part of the Charterhouse, which over the centuries gradually acquire its present vast proportions. 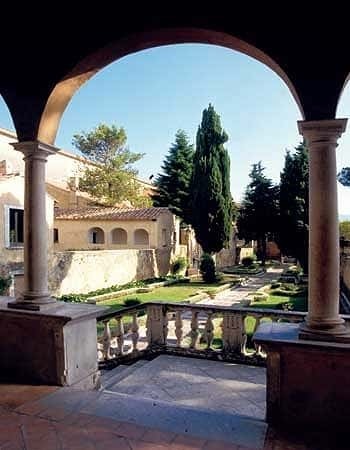 The Carthusian order, founded by St Bruno, with an aristocratic house at Grenoble, was supported by the Angevins, who later also encouraged the foundation of other Charterhouses in southern Italy: that of St Martin in Naples and ones in Capri and Chiaromonte. Little remains of the Charterhouse's original structure. 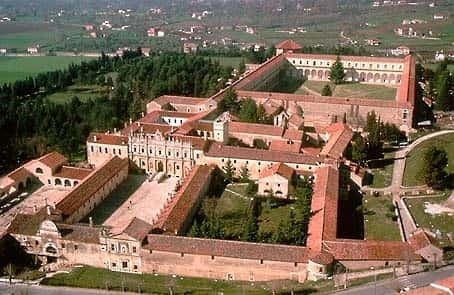 The most significant changes date to the mid XVI century after the Council of Trent, and they include the cloister of the guest quarters and the main façade, to which sculptures and decorations by Vaccaro were added in the XVIII century, as well as the tower of the Squires. 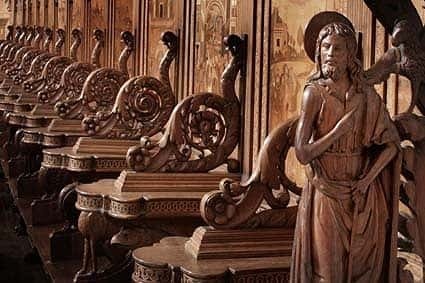 The gilded stuccos in the church, the work of the lay brother Francesco Cataldi, were added in the XVII century. The frescoes and changes of use in the existing areas date to the XVIII century. 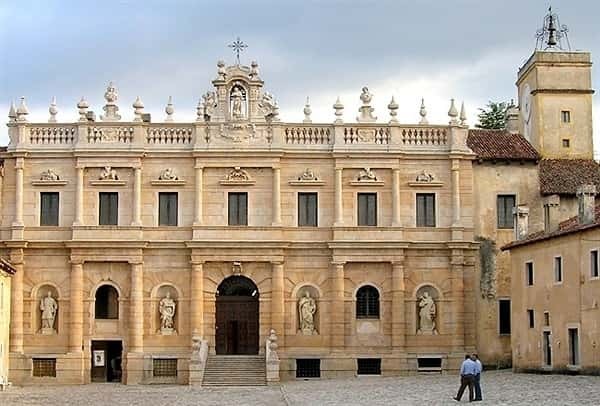 The Carthusians left Padula in 1807 during the French decade of the Kingdom of Naples, when they were stripped of their possessions in Vallo, Cilento, Basilicata and Calabria. The rich furnishings, libraries and art works were almost completely scattered and the monument fell into a state of decay. The external areas fell into private hands, as did part of the "desertum", the agricultural area "of isolation" that surrounded the Charterhouse. During the Risorgimento, the region around the Charterhouse, where many liberal spirits had been born, was the scene of the tragic end of 300 followers of Carlo Pisacane. The Charterhouse was a concentration camp in the two world wars, as we can learn from writings in the external courtyard and painting on the walls on the ground floor of the stairway. Although it was declared a national monument in 1882 and is one of the most important architectural complexes in southern Italy, it was only in 1982, now in the hands of the Division for the Architectural Heritage of Salerno, that restoration work began on it. Much of the productive activity took place in the external courtyard. To the left was the herb garden, the apothecary's house and the guest quarters (reserved, only in exceptional cases, for important religious and aristocratic figures); in the right wing were the lodgings of the lay brothers. This was the "low house" linking the Charterhouse with the outside world. The Church is divided transversely by a wall, the part near the presbytery reserved for the enclosed fathers, who reached it via an internal passage. Here the monks assembled once a night and twice a day: interesting features are the altars in scagliola (a kind of plaster), the XVI-century wooden choir and the wooden door dating to 1374. The small Old Cemetery fell into disuse when the fathers decided to have a new one built in the great Cloister. In the Founder's Chapel is the XVI-century sarcophagus of Tommaso Sanseverino (died in 1324). In the refectory, where there was a rule of silence, meals were eaten together on feast days and during Lent. It is a rectangular, XVIII-century hall; its rear wall is decorated with an oil painting of the Wedding at Cana (1749) by Giuseppe D'Elia. The Prior's Cell is a residential apartment of ten rooms, with the most varied service rooms, an archive, direct access to the library, a pleasant garden with frescoed loggia and a private chapel. It is reached via a doorway separating the fathers' cells from the other areas described so far. There was a large library next to it, with tens of thousands of books, manuscripts (also illuminated), of which only a very small part, around 2000 volumes, is still in the Charterhouse now. The dimensions of the Great Cloister are very striking: at almost 15,000 sq. metres it is one of the largest in Europe. Begun in 1583, it is on two levels: on the lower is the portico with the fathers' cells; on the upper the windowed gallery used for the weekly stroll. During this "outing" the fathers' seclusion was interrupted and they could talk and pray together. 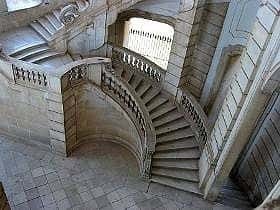 A double-flighted elliptical staircase with eight large windows, links the two levels of the Great Cloister: the work of Gaetano Barba (a pupil of Vanvitelli), it leads to the covered walkway, in whose four wings are displayed works of art restored in the Charterhouse workshops, coming mainly from towns in the Salerno and Irpinia areas that suffered damage during the earthquake. The present appearance of the Park, whose avenues intersect at right angles (walked by the monks in their prayers), does nor in the least correspond to the XVIII-century layout.